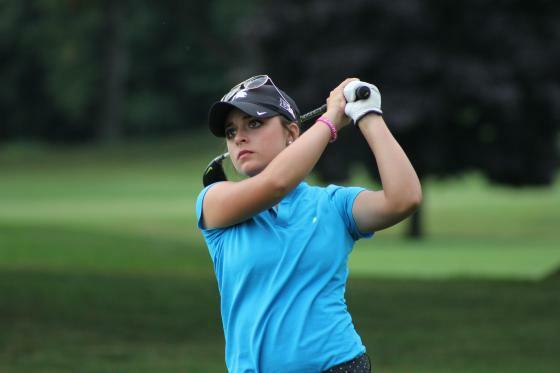 LINDEN – Brighton’s Allyson Geer played a practice round Thursday at Spring Meadows Country Club to prepare for her title defense in the Historic 100th Michigan Women’s Amateur Championship that the club hosts Monday through Friday next week. Spring Meadows, which hosted the 98th Michigan Amateur Championship for the men in 2009, was founded as a club in 1957. It opened its parkland style course with classic lines in 1959. The full-service private club was built on a former cornfield and pasture by the golf course architect Larry Packard of the then Packard and Wadsworth firm, and the varied types of trees on the property have matured and help define many of the golf holes. It plays to 6,923 yards from the back tee positions with six tee choices, but will be set up by the tournament committee at around 6,000 yards for the championship with some skill-testing and risk-reward tee changes during match play. The golf staff is directed by Rick Slaght, the head golf professional, and Craig Henderson, the course superintendent. Last year Geer, who was 16 and just a few days from age 17, became the youngest ever to win the state championship (16) when the 99th Michigan Women’s Amateur was played at Spring Lake Country Club in West Michigan. The home-schooled senior-to-be who will be part of Michigan State University’s 2017 recruiting class, had to go 19 holes to beat Muskegon’s Hailey Hrynewich, an Ohio University golfer. Geer said she came into that week in a slump off the American Junior Golf Association (AJGA circuit), but with her father on the bag decided to make it a fun week and forget about national junior rankings. She plans to work the fun approach again this week at Spring Meadows and have plenty to celebrate when she turns 18 on Aug. 15. The field of 90 golfers will play 36 holes of stroke play, 18 each on Monday and Tuesday, to determine the qualifying medalist and top seed as well as 31 other golfers to fill out the match play bracket. On Wednesday the round of 32 is played to determine the “Sweet 16” who will be celebrated and announced at the traditional evening Sweet 16 Dinner. Two rounds of match play, the round of 16 and the quarterfinals, are scheduled for Thursday and the semifinal and final rounds of match play are slated for Friday. Geer will be part of a special Monday night dinner at Spring Meadows being presented by the Michigan Women’s Golf Association and the Golf Association of Michigan to celebrate the 100 years of the tournament. Several past champions are slated to appear and take part in a planned panel discussion. A special commemorative video is being presented as well. Hrynewich, working on an out-of-state internship this summer for her television journalism major, is not in the field. Julie Guckian, the 2015 GAM Women’s Champion who plays college golf at Grand Valley State University, is a Spring Meadows member and in the field, as is this year’s GAM Champion Anna Kramer of Spring Lake. Most of the top collegiate and high school players from Michigan and GAM Honor Roll leaders are in the field, including notables and sisters Emmie and Hannah Pietila of Brighton and the University of Tennessee. Emmie won the 2012 Michigan Women’s Amateur Championship. Another former champion of note is playing; two-time champion Stacy Slobodnik-Stoll (1996, ’98), who is the 44-year-old head coach of the women’s program at Michigan State University and the future coach of Geer and current coach of some other players in the field. bout the GAM: Founded in 1919, the Golf Association of Michigan is the governing body for amateur golf in the state. As a not-for-profit organization, the GAM’s purpose is to promote, preserve and serve the game of golf. The GAM, served by over 250 dedicated volunteers as well as nine full-time staff, provides membership to more than 55,000 golfers and more than 470 Michigan golf courses, conducts over 30 amateur championships, oversees 15 USGA qualifying events, administers the GAM/USGA Handicap System and measures and rates almost 70 courses a year for the USGA. Learn more at www.gam.org.